No recipes on this post–Kim and I are heading back to Michigan to celebrate this special time with my family–but instead, we’ll leave you with many thanks from us. We’re thankful for each other, our family, and friends. We’re thankful for our health and well being and pray for those in our family who’s currently ill.
We’re thankful for Saveur, who has chosen our posts on tom rang muoi (salt and pepper shrimp), bo tai chanh (beef carpaccio Vietnamese style), ga kho (caramelized chicken), and Korean fried chicken wings for their best of the web feature. 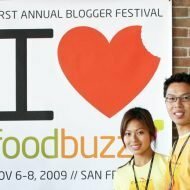 We’re thankful to Foodbuzz and Nature’s Pride for allowing us to experience a wonderful time at the first annual Foodbuzz Food Blogger’s Festival and all the great friends and bloggers we met there. 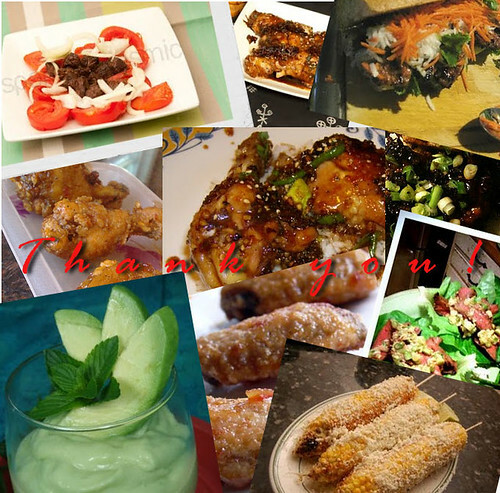 We’re thankful to all of those that have tried our recipes or were inspired by something we made (photo’s above)…Comptoir du Riz, HoustonWok, The Housewives’ Understudy, Smells Like Food in Here, Tasty Treats, Thibeault’s Table, Dog Eat Cat, Bunnyhawk, Eat, Drink, Man…A Food Journal, Deep Fried…Something, Seventh Level of Boredom, TulangiKankewl, Jasmine Cuisine and many more who just left us comments or emailed us telling us how much they enjoyed making our recipes and blog. Last but not least, we’re especially thankful to you, our readers and wish you all health and happiness this Thanksgiving. Since starting this blog on whim back in May we had know idea that it would open up so many avenues for learning about food from other fabulous bloggers as well avenues for friendship–whether it be regular readers who comment from across the country and across the world that we’ve never met, or local Los Angeles bloggers that we’ve met and dined with. So again, thank you and Happy Thanksgiving!! I hope you guys have a delicious and Happy Thanksgiving! The same wishes of happiness and health to you both! Happy Thanksgiving to you and all who celebrate it! Happy travels and Happy Thanksgiving, guys!! 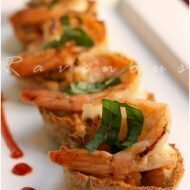 Can't wait to get together for Eat My Blog next weekend. THANK YOU FOR THE MENTION AND KIND SENTIMENTS! It means alot to me to have foodie friends like you not to mention the great recipes you all share. Happy Thanksgiving to you and your families! My Thanksgiving Day turned out better than I'd ever imagined. I hope your day, spent with family in what turns out to be our shared homestate of MI, was just as happy and wonderful. As for your mentioning my simple food journal on your blog, I'm speechless. Well-wishes to those of yours who are ill and Happy Thanksgiving to you and your family! Thank you so much for all the well wishes and warm thoughts on Thanksgiving! We had a great time in Michigan and are glad to be back. Hope you two had safe travels back to Michigan! Asian food for Thanksgiving. Everything looks great. 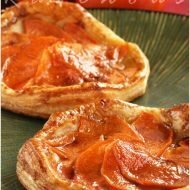 Thanks for all your wonderful recipes.